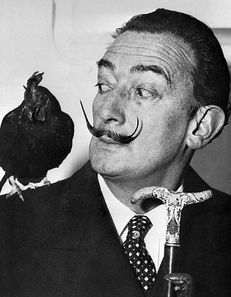 Salvador Dalí was a famous Surrealist artist from Spain. He was highly imaginative and enjoyed shocking people with both his art and his behavior. He nearly always had a long cape, walking stick, and sported a long, waxed moustache. Dali’s bizarre manner and attention-grabbing public actions sometimes drew even more attention than his artwork. He was a talented painter whose art also included prints, drawings, sculpture, photography, films, and theater set design. Our painting of the week is a very well-known painting by Dali, The Persistence of Memory (1931). It is sometimes called Soft Watches, because it shows melting pocket watches in a landscape setting. Each of the watches have a different time on their dial. The meaning of the watches is up to the viewer. Some believe it makes the point that time is not rigid and that nothing lasts forever. When asked what inspired him to paint the watches, Dali only said he got the idea after seeing some melting cheese. Surrealism began as a cultural movement. It was started by a French poet in 1924. The word "surrealism" means "above realism". 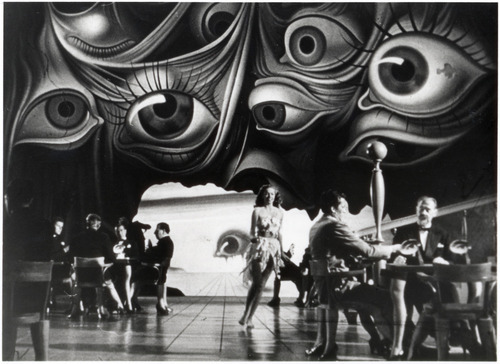 Surrealists believed that the subconscious mind, such as dreams and random thoughts, held the secret to truth. The movement had an impact on film, poetry, music, and art. Surrealist paintings are often a mixture of strange objects (melting clocks, weird blobs) and perfectly normal looking objects that are out of place (A lobster on a telephone). They show the world of dreams and fantasy mixed with the real world. Surrealistic paintings can be shocking, interesting, beautiful, or just plain weird. Salvador Dali was the most famous of the Surrealist painters. Ducksters.com,. 'Biography: Salvador Dali Art For Kids'. N. p., 2015. Web. 27 Apr. 2015. Salvador Dali was a skilled draftsman (good at drawing), but he is best known for the memorable, bizarre images in his surrealist art. He drew upon dreams and his subconscious to create scenes that were wild and unusual. Yet these wild scenes appeared real due to Dali’s artistic abilities. Between 1941 and 1970, Dalí created an ensemble of 39 pieces of jewelry, some of which contain moving parts. The most famous jewel piece, "The Royal Heart", is made of gold and is encrusted with 46 rubies, 42 diamonds, and four emeralds and is created in such a way that the center "beats" much like a real heart. Dali created sculptures, theater sets, and worked in photography and film. He once produced a dream sequence for an Alfred Hitchcock film, Spellbound. He also worked with Walt Disney on an animated movie, Destino. After the war, Dali created some religious paintings. In 1951, he painted Christ of St. John of the Cross. Salvador Dali was nearly as well known for his colorful personality as for his art. He seemed to love to shock people. He wore a long, waxed moustache as his trademark, which he liked to bend into unusual shapes. 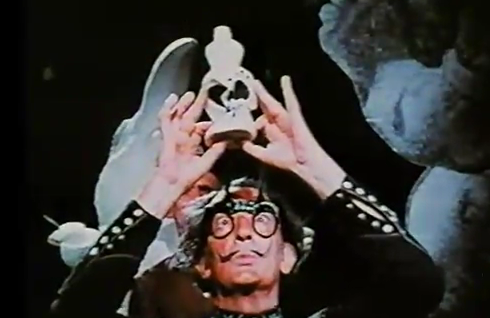 Dali’s character has been parodied many times. Parodied means to imitate in an exaggerated way, usually for humor. Captain Kangaroo’s TV show had a “Salvador Silly”, and Sesame Street had a character named “Salvador Dada”. Dali once presented a lecture for an art exhibit wearing a deep-sea diving suit, carrying a billiard cue, and leading a pair of Russian wolfhounds. Dali liked wild animals and owned a pet ocelot, Babou, which he liked to take with him on travels. A photographer snapped a photo of him exiting a Paris subway with two anteaters. 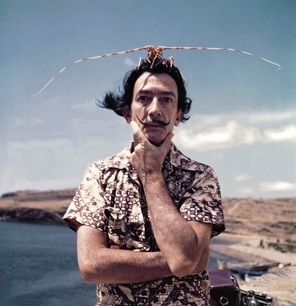 Dali was viewed as extravagant and appeared in several advertisements for Lanvin chocolates and for airline companies. Yet, Dali had a method for avoiding paying his bill at restaurants. He would write a check, then draw something on it. This usually worked, because the restaurant would keep the check as a valuable sample of art instead of cashing it into the bank. Salvador Dali created over 1500 paintings in addition to the art he produced in other media, such as sculpture, theater sets, and photography. He wrote an autobiography, The Secret Life of Salvador Dali, which consists of fact mixed with stories he made up. 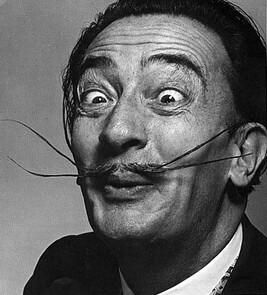 Dali was famous during his lifetime, unlike many artists of the past. He once appeared on a popular TV quiz show, What’s My Line? 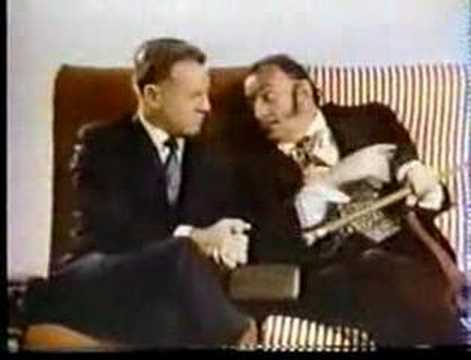 The contestants wore blindfolds and tried to guess Dali’s occupation by asking yes and no questions. 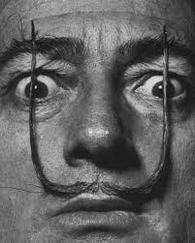 In the late sixties and seventies, Dali worked at creating a museum in his Spanish hometown of Figueres. He placed the museum at the same site where he held his first art exhibition at age 14. Dali designed the building, and it opened in 1974 as the Dali Theater-Museum. It is the world’s largest Surrealist structure. 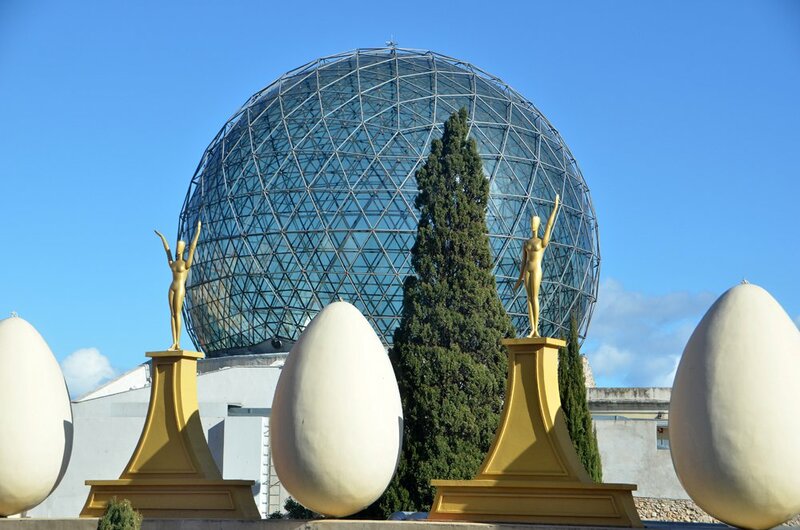 It houses over 4,000 works by Dali, along with art pieces from other artists. 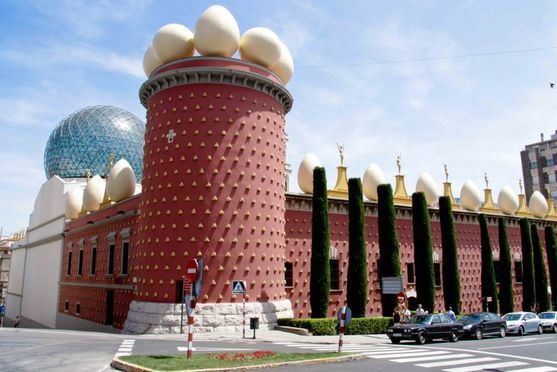 The museum is considered to be Salvador Dali’s last great work. Above is a Surrealist collage created by Mrs. Hurdle. The photo at left shows a close-up of one corner. It's fun to make a Surrealist collage. Use photos of real scenes and place cut-out or drawn objects within the scene. Let your imagination go wild as you create a surreal scene.